This article first appeared on Telegraph, the e-letter of the Swiss-Maltese Chamber of Commerce, on 28 November 2014. Click here to access article. 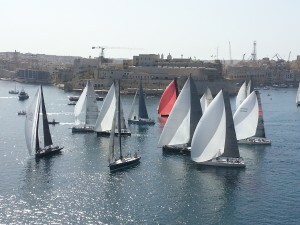 On a sunny Saturday morning a few weeks back, a client from overseas and I craned over a large crowd of people at a prominent garden on the bastions surrounding Valletta to watch the start of the Rolex Middle Sea Race, one of the world’s great classic offshore races, 608 nautical miles long. A few months back, we were in a hotel lobby in St Julians to discuss his family’s move to Malta when I had described the spectacular start of the previous year’s race. I recall that he was intrigued by the benefits offered by the various residency schemes in Malta but I am sure he was definitely more captivated by the photos of the start. I cannot blame him – the image of the large sails, extended to their maximum capacity to capture the light breeze in a harbour surrounded by high honeycoloured bastions is absolutely stunning. I suppose that image captures Malta’s essential characteristics: the fabulous allyear round weather (it hit the 25o degrees Celsius mark on the day of this year’s start, 18 October), Malta’s rich legacy of historical buildings and architectural gems and the various perfect spots for sports (whether it’s sailing, golf, scuba diving or snorkelling). Add to that the relatively low cost of living in Malta, Malta’s first class healthcare services, high quality education whether at primary, secondary or tertiary levels, the wide range of properties available to rent or purchase and the fact that most entertainment hubs are always within walking distance, and you end up with a true five-star destination. And, of course, there are no communication problems with English being an official language, Italian being widely spoken as well as German and French within the tourism sector. My client – and, now, friend – has now moved together with his family. His young children attend school in Malta and has settled down brilliantly in a matter of a few months. He travels week in, week out, but it just takes two to three hours flying time from most European cities. And, by the next Middle Sea Race, he should be formally resident in Malta under the recently unveiled “The Residence Programme”. This programme is one of the many programmes available for high net worth clients wishing to establish their residence in Malta. The ideology behind residence has developed along the years. Originally it implied that one had a fixed home in that country, however it has now been sufficient to prove presence in the particular country. Maltese tax law defines a ‘resident in Malta’ as “an individual who resides in Malta except for such temporary absences as to the Commissioner may seem reasonable and not consistent with the claim of such individual to be resident in Malta” and a person is deemed to be resident in Malta if he resides in Malta for a total of 183 days in a year. Tax status in Malta also depends on ordinary residence and domicile. If a person is both domiciled and ordinarily resident in Malta then such person is subject to income tax in Malta on their worldwide income and capital gains. If, on the other hand, a person is ordinarily resident but not domiciled in Malta, then such person is only taxed on Maltese source income and capital gains and on foreign source income received in or remitted to Malta. This remittance base of taxation is in itself a major point of attraction to becoming a resident in Malta. In addition, Malta has a vast and growing double tax treaty network with the aim of eliminating double taxation. The Government of Malta has, over the years, introduced a number of specific legislative instruments which offer great benefits to those wishing to set up residence in Malta. (vi) being fit and proper. Persons qualifying under the Residence Programme Rules will be subject to tax at a reduced rate of 15% (subject to a minimum of €15,000 for any year of assessment) on any income arising outside Malta in the year immediately preceding the year of assessment which is received in Malta by the beneficiary, their spouses and children, with the possibility of claiming double taxation relief. On the other hand, “The Global Residence Programme Rules” apply to those individuals not coming from the EU, EEA, or Switzerland and who take up residence in Malta. As a result, such individuals may also benefit from a tax rate of 15% (subject to a minimum of €15,000 for any year of assessment) on any income arising outside of Malta and received in Malta. Here again, a number of requirements similar to those under the Residence Programme Rules must be met. Another interesting programme seeks to attract resident but non-domiciled individuals employed in the financial services, aviation and gaming sectors. Provided they occupy those positions set out in the “The Highly Qualified Persons Rules”, those in receipt of a minimum annual salary of €81,205 (for year basis 2014) benefit from a 15% flat rate of tax for a determined number of years. Interestingly, since the Sixties, Malta has attracted retirees – most of them having old British army, navy and air force service links to Malta. This trend has continued along the years – especially with the introduction of the “Malta Retirement Programme Rules” pursuant to which pensions of EU, EEA and Swiss nationals resident (but not domiciled) in Malta, in possession of a “qualifying holding property” and whose pension constitutes at least 75% of the individuals chargeable income, are subject to a tax rate of 15% on their foreign source income, provided that this is not less than €7,500 per annum and a further €500 per dependent. These tax incentives coupled with the unique quality lifestyle have turned Malta into a perfect luxury expat location of choice. Various options can be adapted depending on the requirements and tax status of each individual. As the Middle Sea race, year on year, continues to grow in prestige, stature, record entries and media attention, Malta continues to take line honours in offering the best combination for a down-to-earth, picturesque and affordable expat destination. The information presented in this article shall not be construed as legal advice, is not to be acted on as such, may not be current and is subject to change without notice.